You probably missed these movies when they were in theaters, but now you can stream them on Netflix! This week we have some overlooked or underrated gems, movies that slipped under the radar or were somehow misunderstood the first time around. There are movies based on classic literature, movies that sing and dance, and movies that blow stuff up. There are stories about real life, stories that just feel like real life, and stories that feel like nightmares. Then we have some earlier performances by some of the current Oscar-nominees, notably a very good forgotten Michael Keaton movie, as well as Rosamund Pike and Robert Duvall together in a thriller. Stream away! Director Brad Anderson may not be as celebrated as his fellow Andersons Wes and Paul Thomas (none of whom are related to me), but he’s a very good, dependable genre director, capable of sturdy horror and suspense films. His latest, Stonehearst Asylum (2014), is based on an Edgar Allan Poe story “The System of Doctor Tarr and Professor Fether.” In 1899, Edward Newgate (Jim Sturgess) arrives at the remote Stonehearst Asylum, hoping to become a resident doctor there. Newgate meets superintendent Silas Lamb (Ben Kingsley) and the beautiful inmate Eliza Graves (Kate Beckinsale), who has the “hysteria.” In a creepy dungeon, a prisoner (Michael Caine) claims to be the real superintendent. Anderson creates a great, atmospheric space for his asylum, and it becomes a grim, expressive character all its own, much like the abandoned asylum in his earlier Session 9 (2001). Some viewers may be able to detect the story’s twists early, but even so, Anderson appears to be having a delightful time with them. One of Anderson’s earlier films is also available streaming, The Machinist (2004), which is notable for star Christian Bale dropping 64 pounds to play the lead role. Trevor Reznik works in a machine shop and has chronic insomnia; he hasn’t slept in a year, and he keeps losing weight. A prostitute (Jennifer Jason Leigh) he frequents tells him that he’s going to disappear. A new worker appears on the job, and he begins seeing strange things, experiencing weird memories. A “hangman” drawing appears in his home. Again, the twisty plot may not be well-hidden, but it is well told. Anderson decorates the film in machine metal blue-gray, dreary and ominous, with a creepy Theremin score whistling throughout. Strangely enough, Paramount Classics released this for the Thanksgiving holiday! Bale probably needed a huge feast to bulk back up for his next role, Batman. This documentary about actor George Takei, famous for playing “Sulu,” might seem like a fun time for Star Trek fans; but in truth, it’s a highly informative, somewhat profound, and very moving story of racism, bigotry, forgiveness, empathy, and love. As a Japanese-American child in the 1940s, Takei was raised in internment camps, surrounded by armed guards and barbed wire walls. He became an actor, but was forced into stereotypical roles. 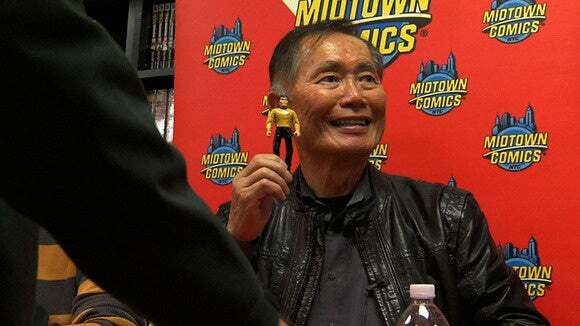 Many of the interviewees, however, credit Takei’s appearance as Sulu as one of the first examples of positive Asian representation in popular entertainment. Later, Takei had another struggle; his long-closeted homosexuality. We meet Takei’s longtime partner Brad, who is a fascinating character all his own, not willing to suffer Takei’s actorly facade or his celebrity lightly. In the end, To Be Takei (2014) is a sweet, fascinating, in-depth portrait of an outsider who may or may not be a great actor, but who impacted the world in many unique ways. With the world’s love for big, expensive musicals still unwavering, it’s a wonder why Jacques Demy’s The Young Girls of Rochefort (1965) is still such an unknown curiosity. A follow-up to his smaller, sadder The Umbrellas of Cherbourg, it’s a weird mix of reality and fantasy, American, and French. Real-life sisters Catherine Deneuve and Francoise Dorleac (who sadly died just two years later at the age of 25) co-star as movie sisters, running a little snack bar and dreaming of falling in love and being swept away to Paris. Several men show up, and everyone falls in love all at the wrong time, causing much running around, dancing, and singing. The movie is brightly colored and wide in scope, and Michel Legrand’s jazzy tunes are difficult to get out of your head. Gene Kelly—slightly older, but still graceful—shows up for a couple of sublime numbers. It can be somewhat awkward following the songs and dancing and reading English subtitles at the same time, but once you get into the rhythm, this is a delightful movie. Michel Piccoli and Danielle Darrieux also appear. People who are in love with Michael Keaton’s performance in the amazing Birdman might wish to go back and look at some of his more underrated or forgotten work, like Michael Hoffman’s dreamily vivid Game 6 (2006). Keaton stars as playwright Nicky Rogan, who has a new play debuting the same night as the soon-to-be-infamous game six of the 1986 World Series between the Boston Red Sox and the New York Mets. A Sox fan, Nicky tries to decide whether he should skip the play and catch the game. But he worries about a scathing review from a notorious theatre critic Steven Schwimmer (Robert Downey Jr., also great). Written by acclaimed novelist Don DeLillo and set over the course of a soul-searching day, the movie is in love with the sound of words as well as with the deliberate, sensual pace of a good ball game. Griffin Dunne, Bebe Neuwirth, Catherine O’Hara, and Ari Graynor also star. Hollywood loves to make movies about oddball opposites who meet up and learn about life from each other. Usually movies make the mistake of going to extremes with these characters and taking them too far from life. Ramin Bahrani’s Goodbye Solo doesn’t make that mistake. 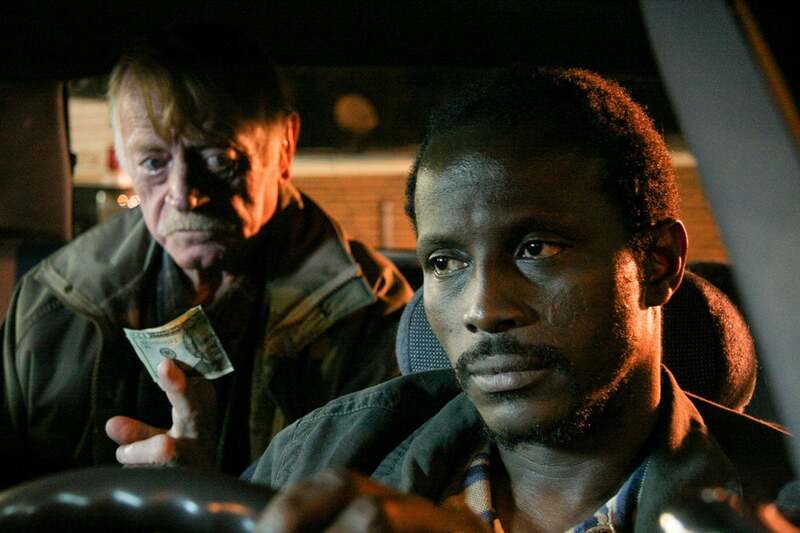 Solo (Souleymane Sy Savane) comes from Senegal and now drives a cab in North Carolina. He dreams of getting his pilot’s license, and tends to work more in favors and trading than he does cash. One day he picks up an aging good ol’ boy, William (Red West), and though nothing is ever spoken, he believes that William plans to kill himself. So Solo begins to try to show William about how great life can be, even if it comes with little trials and tribulations along the way. In his acclaimed first two films, Man Push Cart and Chop Shop, Bahrani used a gritty, observant, realistic style to explore themes of routine, loneliness, and hope. He continues that trend with this, his most accessible movie to date. Based on a pulp novel by English writer Lee Child, Jack Reacher is like a European crime movie, perfectly timed but moving at half speed and with some kind of existential meaning lurking just below the surface, not to mention Werner Herzog playing a mysterious and deadly bad guy called “The Zec.” Unfortunately, with Tom Cruise in the lead role, viewers had certain expectations that were not met, and the film remains an underrated entertainment. Cruise plays a former army sniper who lives “off the grid” and arrives in Philadelphia to investigate a shooting in which five seemingly random people were killed. Current Oscar-nominee Rosamund Pike plays a lawyer assigned to the killer’s case, Richard Jenkins is her father, the D.A., David Oyelowo plays a police detective, and Robert Duvall plays a cranky old rifle-range owner. Oscar-winning screenwriter Christopher McQuarrie (The Usual Suspects) directs with the same druggy, displaced style of his previous film, the odd cult classic The Way of the Gun. 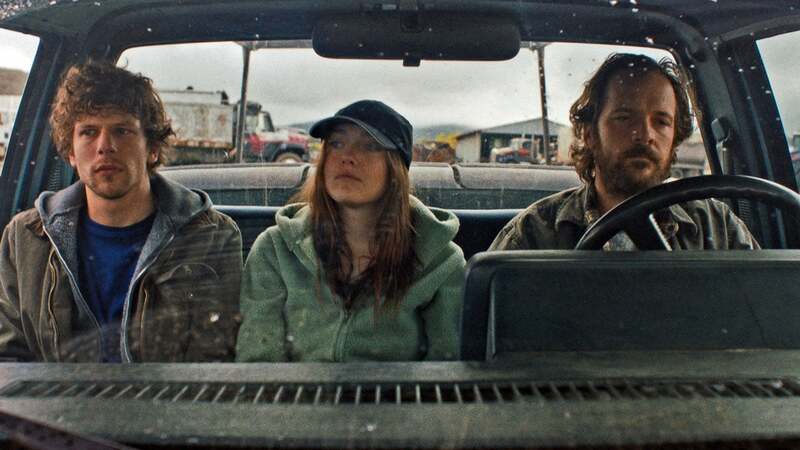 Indie director Kelly Reichardt (Old Joy, Wendy and Lucy, Meek’s Cutoff) makes movies with long silences and stretches of moody contemplation. Night Moves (2014) is a bit more complex, digging into sociopolitical gray areas and generating a slow-burning suspense. It tells the story of three radical environmentalists, an organic farm deliveryman (Jesse Eisenberg), an ex-rich girl Dena (Dakota Fanning), and an ex-Marine (Peter Sarsgaard). They spend a great deal of time preparing for their latest job, blowing up a hydroelectric dam in Oregon. But when the night of the job finally arrives, it raises more questions: what good has it done? What harm? The characters are guarded and stoic, and the rising sexual tension between the trio is left deliberately unexplained, but it makes them all the more fascinating. Many critics complain that “nothing happens” in Reichardt’s films; but if you look a bit closer, everything happens. 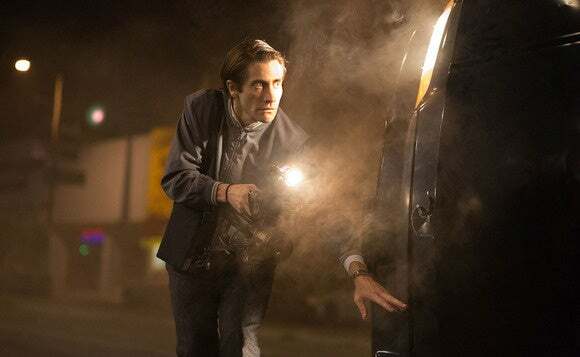 Jake Gyllenhaal gives a positively creepy performance, looking weirdly skeletal and bug-eyed, as Louis Bloom, a Los Angeles loner and outcast who perpetually polishes his positive salesman’s attitude. He makes a living stealing and selling scrap metal, but finds his calling when he accidentally witnesses two cameramen “nightcrawlers” filming nighttime accidents and crimes for the morning TV news. He blunders his way into the same job, making some mistakes, but eventually making a connection with producer Nina Romina (Rene Russo, at her best). Unfortunately, Bloom not only becomes a little too good at his job, he also becomes slightly less objective when it comes to journalistic integrity. Screenwriter Dan Gilroy makes his directorial debut here, and it strikes a bold balance between gritty realism and a surreal nightmarish quality. His original screenplay is currently nominated for an Oscar. Bill Paxton co-stars.